My Employment Experience in the New York Times | Which me am I today? At the weekend, I had an amazing surprise when the New York Time published an article on employment that they’d asked me to write some time ago. I’ve learnt that these things often take ages to come to fruition but it finally happened on Saturday. They’d asked me to write about my employment experience, once diagnosed, and I hasten to add MY experience. The whole process has been well documented many times, but I found the experience fascinating as I had to rewrite sections and change wording to fit in with American writing. Now I don’t usually read the comments section on any article I write, as I’d often been warned not to, however curiosity got the better of me as I wanted to see it from an American perspective. There were some very kind comments but also the usual disbelief in the fact that I can possible have dementia and write. I so wanted to respond but couldn’t work out how. Sometimes I wish I couldn’t write. People might believe me then. But I love writing so much and write oodles every day just to keep dementia outside my fingertips, because I am fearful of losing that ability. I wanted to say that my SPECT scan obviously didn’t show the sluggish area which signifies dementia….my memory tests must have been incorrectly marked….and my day to day struggles and changes must be a figment of my imagination……..like so many others our diagnosis is so often questioned because we don’t fit the norm. But going back to the article. As you can imagine I was met by much defensiveness when my book came out and my words were read. I learnt how others had told a different version, denying, trying to convince people that it happened differently. I actually felt sorry for them having to do that. What they didn’t seem to consider was, of course they would see the episode differently, they hadn’t just been told they had dementia. For the managers, occupational health and all the others, it was a day like any other but with the added interruption of an employee wanting to talk to them. I actually wrote the words, “how long have you got’, in my notebook that I took to all meetings. That’s how I know they were said. They were probably not meant as they appeared but they had a life changing affect on me. I actually wrote detailed notes of other meetings, that’s how I know what happened. I don’t deny there was another version of the episode, of course there was; I’m not criticising how it was dealt with – it highlighted the ignorance around dementia. My life had been turned upside down at that point. Maybe I didn’t help anyone’s day with my confession, maybe I embarrassed, maybe they too had personal troubles. All these things contribute to how we react to distressing news. When the police ask for witness versions of events they’re used to getting several versions as people see things differently. This is no different. But it goes to show how words matter, no matter what the situation. Words can make or break someone’s day; can have a profound effect on their lives or make them feel better. Just like the words of verbal bullies, which often mean nothing to them, can profoundly affect someone’s life forever. so can any words spoken at any time, stay with someone, no matter what the intention, just like they did for me. We’ve all done it without thinking, said the wrong thing at the wrong time, but you don’t know what’s going on in that persons life at that moment…..
Next time you find yourself in a difficult situation or expressing an opinion, think carefully about the words you use………they could stay with them forever……. Taken from my dear friend google…. The New York Times! Congratulations!! 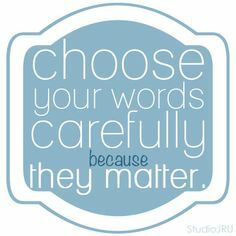 Choosing our words carefully is so important. A good reminder. Thanks. Congratulations, Wendy! You inspire me. About four years ago, the New York Times chose one of my comments that I had posted on an article as a “NYT Favorite,” and I was amazed by that. But to have an article you wrote actually published in the NYT — WOW! That is wonderful! Thanks Wendy. It must be hard when people don’t believe you have dementia. For me your words are always so powerful. You draw me into your experience and your integrity and authenticity are clear to me. I read it today in the International version of the NYTimes. Fantastic article. And Wendy I am so grateful you can write.